I'm (obviously) a writer. Before I was a writer, I was a reader. And before I was a reader, I was a kid who sat down to watch a show called Reading Rainbow on a grainy old CRT television. "Take a look, it's in a book, a reading rainbow." Two decades after the fact these words are still burned into my brain. Each episode, LeVar Burton would visit some exotic locale tangentially related to whatever book was about to be read to us—like, for instance, Rosie's "authentic roadside diner" in advance of The Robbery at the Diamond Dog Diner. Now imagine Reading Rainbow was a culturally-aware video game, and you've got Never Alone. Never Alone is a game about stories, or really one story in particular: "Kunuuksaayuka" by Robert Nasruk Cleveland. It's a story of the Inupiat, an Alaskan native people, wherein a tiny village is beset by a raging blizzard. One man has the courage to seek out the cause of the blizzard. 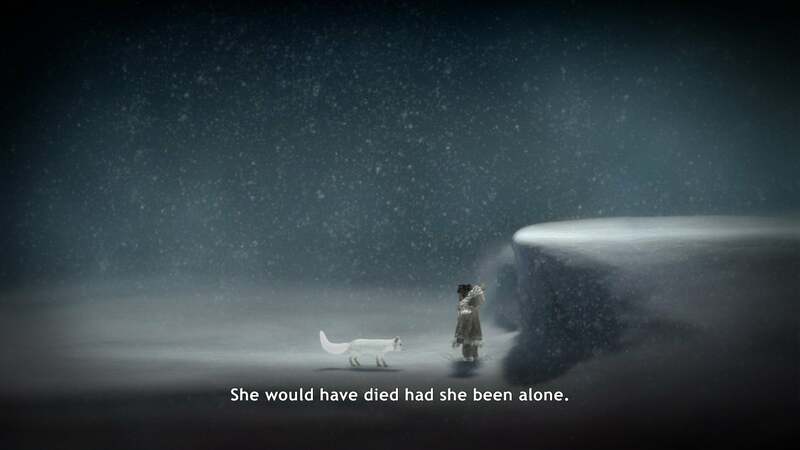 Only in Never Alone it's actually one girl, Nuna, and her adorable arctic fox companion. The two have to help each other across the treacherous Alaskan landscape to find what's causing the blizzard and (hopefully) stop it before it consumes Nuna's village. 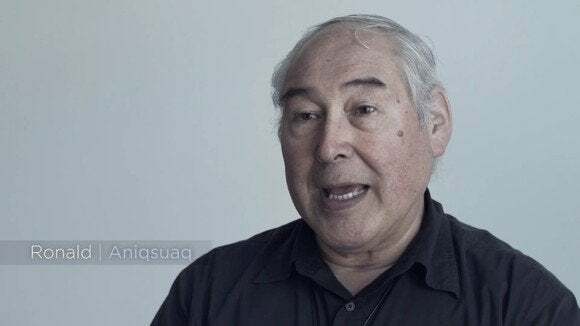 The story is narrated by a member of the Inupiat, the tale told in its native language with subtitles, and is conveyed as a blend of in-engine cinematics and hand-sketched animations. It's not a very complicated tale, fitting in with European fairytales or folklore. 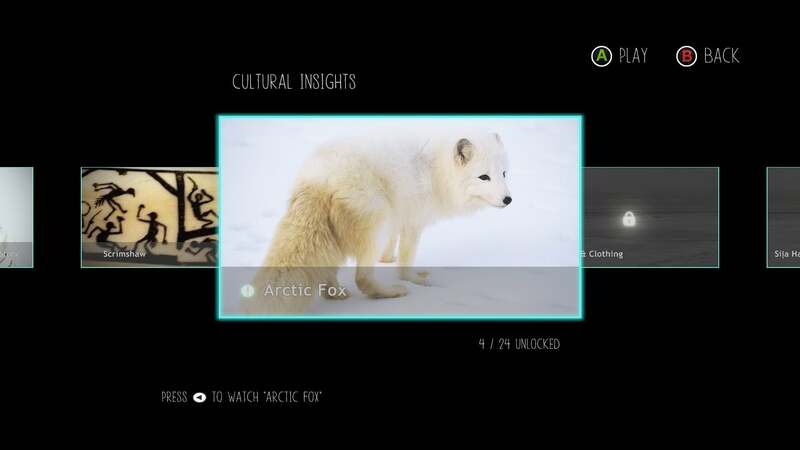 But the story is less a great work of fiction and more a lens through which the game examines the Inupiat people. Each level contains a number of "Cultural Insights"—short documentaries (a few minutes at most) that highlight some aspect of the Inupiat. In other words, it's Reading Rainbow in the context of a video game. You have the game itself, but then you have these real-life documentary portions that provide context for the various game mechanics. For instance, when you first come across Nuna's arctic fox companion you'll unlock the corresponding Cultural Insight—a gorgeous piece about a tamed arctic fox, told by Ronald (Aniqsuaq) Brower, Sr. "When I was growing up my grandpa had a pet white fox," says Brower. "If you're good friends with a white fox, if there's danger about they try to keep you out of trouble." The Northern Lights are an "enemy" because in Inupiat culture the aurora is traditionally considered to be the souls of those who died as children, and if they get too close they'll "play Eskimo football with your head," according to another of the game's interview subjects. Even the art was done in concert with the Inupiat, the game trying to appropriately represent every aspect of the native culture. It's like Ubisoft's World War I tribute earlier this year, Valiant Hearts, except the level of polish on these Cultural Insights puts the written historical notes in Valiant Hearts to shame. I watched all twenty-four Cultural Insights and I would've watched twice as many without getting sick of them. Hell, I would've watched an entire documentary film from the Never Alone team. The speakers are lively and tell great stories, the production value is gorgeous, and it's a genuinely interesting context to what is otherwise a fairly ho-hum platformer. It's this latter portion that's problematic. You know, the game portion. 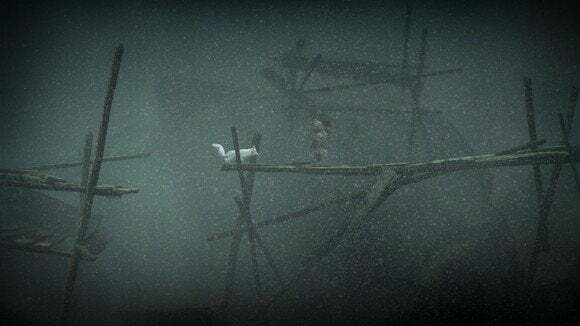 Like Valiant Hearts, Never Alone is a puzzle platformer. I'll leave aside the fact that puzzle platformers on the whole are an incredibly played-out genre. (It's true—they are.) However, they're also an easy genre to dabble in, and if it means we get games concerning a broader range of topics (World War I and the Inupiat people certainly aren't standard game settings) then I guess bring on the damn puzzle platformers. 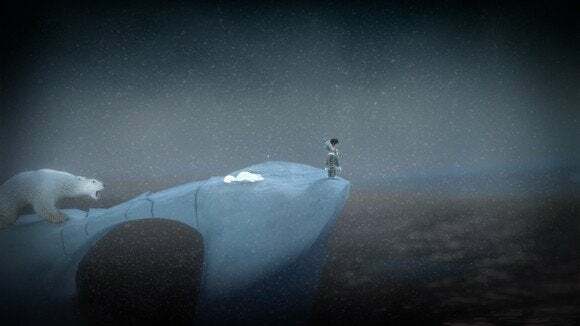 Of more concern is the fact that Never Alone lacks the polish of, say, a game created by a small team within mega-developer Ubisoft. 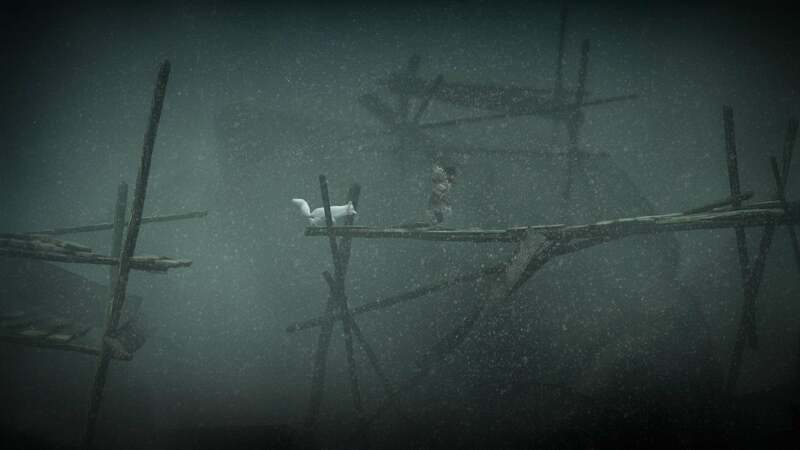 Never Alone is a puzzle platformer, but it's also a janky puzzle platformer. The controls are not as tightly tuned as they need to be, the difficulty fluctuates at random, and it falls into some game design traps that a veteran studio would avoid on instinct in 2014. Most frustrating is the fact that the game is designed to be played either in co-op or singleplayer. In singleplayer mode you flip back and forth between the two characters to solve puzzles. However, the AI companion still counts as a person who can "die," so if the computer screws up a jump or falls behind or gets stuck through no fault of your own, you still might find yourself forced to repeat a section for the dozenth time because of the no-good-stupid-computer-character-that-can't-stick-the-damn-landing. Sorry. It's really frustrating, especially because I want to enjoy Never Alone so much more than I actually do. It's just such a teeth-gritting experience to get through some sections of the game that at many points the promise of another documentary tidbit was the only thing keeping me going. And keep in mind I'm playing the game after the release of Patch 1.1, which specifically says "In single-player mode, the character you're not controlling will behave more intelligently." If that's true, I shudder to imagine what the companion AI was like upon release because it's still utterly moronic. It's so easily solved too. The dumb companion AI wouldn't be a big deal if Never Alone took a cue from modern game design and just had the computer-controlled character blink back into existence whenever it died—you know, the way Tails would float back onto the screen whenever the computer was too dumb to keep up in Sonic the Hedgehog 3 two whole decades ago. Instead, even with all the gorgeous environments Never Alone becomes a chore to play long before its three to four hours is up. And that's a shame because the potential in Never Alone is so high—the game starts out well enough, with you sprinting away from an angry polar bear, and both the aesthetic of the game and the documentary portions are delightful. The whole game needs another layer of polish though. Here comes the part where I admit I'm scoring this game higher than I probably should. I've struggled and I've struggled and I've struggled with this score, and if you want to leave now and pretend I rated it two-and-a-half or three stars, be my guest. That would be a fair rating, as far as the game itself is concerned. But I can't. The documentary aspect is so strong, the aesthetic so gorgeous, the ties to the Inupiat culture so interesting not just in the context of this game but in the context of this entire industry, that I can't rate it that poorly. 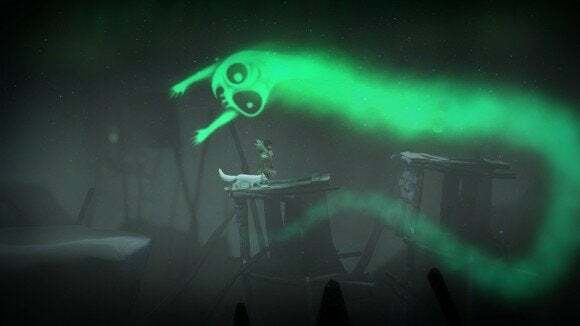 Like the team behind Rise of Flight getting commissioned by the Russian government earlier this year, or what Ubisoft did with Valiant Hearts, the promise of Never Alone is a future where edutainment is a force again. Not the 90s version of edutainment, but an inception that's polished and factors in decades of lessons in game design. In other words, a Reading Rainbow for video games. 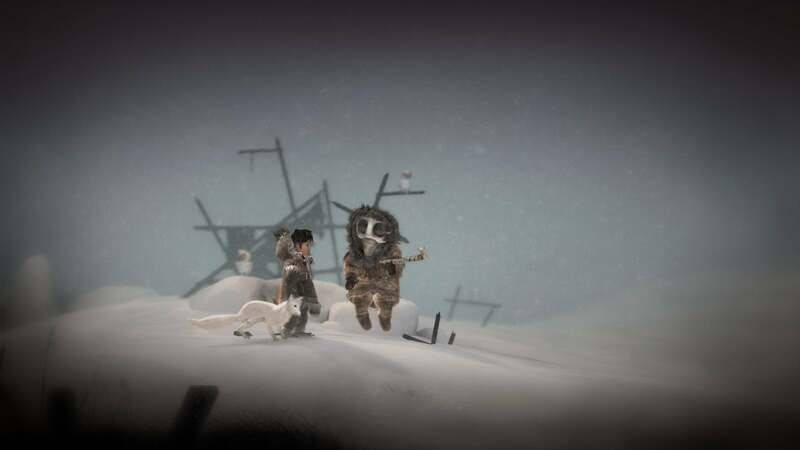 Never Alone is a fairly ho-hum platformer with an intriguing hook—the culture of the Alaskan native Inupiat people.